I’m always alert for research opportunities, and this week I was rewarded beyond my wildest dreams. As you may know, I’m redoing my book covers. I’ve hired a professional photographer to do the main images but I’m filling in the backgrounds myself, so I needed a tractor/trailer unit for Book 8: SPY NOW, PAY LATER. John R., one of the true Knights of the Road who’s been trucking for 48 years, generously agreed to let me photograph his truck. When we arrived at the depot, John offered to move the truck to where I could get a good shot. Then he asked if I wanted to get in the cab while he moved it. Well, hell, yeah! I clambered eagerly into the passenger seat and peppered him with questions about the gauges and the engine and the air brakes and the jake-brake (engine retarder brake) and everything else, while he patiently explained it all. I’ve always loved the roar and snort of the big diesels and the bone-rattling growl of the jake-brake, but I’ve never had a chance to get up-close-and-personal with them. Perched in the passenger seat grinning from ear to ear, I basked in the auditory delight while he drove across the yard. Do I? Are you kidding? I was up into that passenger seat so fast I don’t think my feet even touched the steps. When we reached the Trans-Canada Highway he turned left, which surprised me. I thought it would have been easier to turn right instead of crossing the median with the big rig, but whatever. I was in my glory, and John even indulged me by using the jake a couple of times even though it was completely unnecessary (we were out in the middle of nowhere so it wasn’t prohibited). At the next small town he turned around to head back, but after crossing the median again to get us on the right side of the highway, he pulled over onto the shoulder and stopped. After a moment of paralyzed disbelief, I jumped at the chance. My heart pounded so hard I thought I might have a heart attack and I’m pretty sure John’s steering wheel still bears the imprints of my white-knuckled grip, but I drove an 18-wheeler! How cool is that?!? 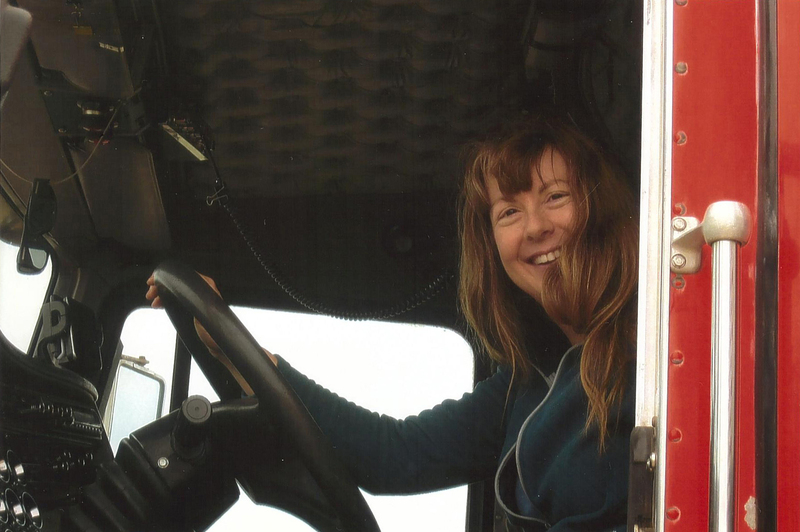 My short but thrilling trucking career (wild hair and all – we had the windows open so I could enjoy the sound of the engine). I certainly didn’t perform any great feats of driving skill – John shifted the gears from the passenger’s seat because I couldn’t figure out the split-shift and keep my eyes on the road at the same time. But I kept it between the lines and I made the two turns off the highway and onto the yard without dropping the trailer into the ditch, so I’m going to call it a success overall. And it was a giant thrill! Have I mentioned lately that I love being a fiction writer? Many thanks to John for my big adventure, and to his wife Nellie for documenting it with photos! Awesome, young lady! when you run out of spy stories, you can go long haul. That is awesome! Congrats! I remember the first time I drove one of the bigger trucks for the USPS; scared the heck out of me. Exactly, so, to everyone who reads this, the next time you get the opportunity to cut in front of a loaded 18-wheeler, PASS IT UP! Just riding in one scared me so much I spent the whole time in the bed in the back, while my boyfriend drove his super-B through a very hilly city. Made his previous life as a cop in the Caribbean seem like a dream job. LOL…This reminded me of so many at the race track reiterating the first time they ever got on a racehorse!!! as exercise riders. Glad you had fun Diane. 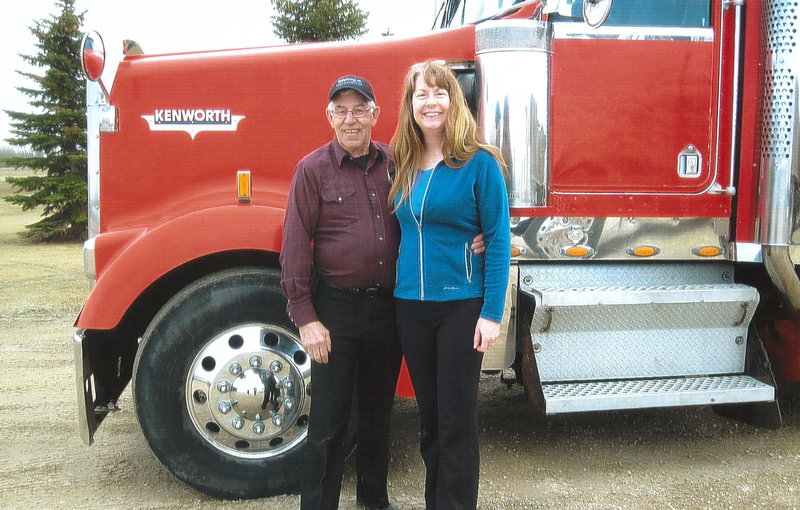 Congrats on driving a “Big Rig!” My father in law drove a truck for eons and I got a ride once, so I know how you were feeling riding along. HOWEVER, I wasn’t allowed to drive, although I did ask. OH well, probably a good thing. I have to tell you, I was reading 2 separate article on writing fiction, one by Henry James and the other by a guy named Howell(s). While I was reading these for my LIT514 class I kept thinking of you and your characters. James’ writes in his article called “The Art of Fiction”, “The characters, the situation, which strike one as real will be those that touch and interest one most, but the measure of reality is very difficult to fix.” (meaning to obtain). I think that’s why writing fiction for me is out of the question. I rather write non-fiction any day. And I have to tell you, you achieve this aspect of fiction extremely well. I do think a 46/47 year old woman becoming a spy is far-fetched, BUT what you create with Ayden is a woman like many of us. We are just trying to get through each day, we worry about the extra 10lbs around our middle, and for some of us we dream of what could be. In many ways, Ayden is a lot like us (well not me) but there are aspect of her character that you would find in women in general. I thoroughly enjoy reading your books. James’ acknowledges that characters matter (I have to wonder how much cause his are so down right irritating) but what he didn’t mention is that characters matter so much more than a writer can anticipate. If your characters are weak and not developed then your story will fall flat. In fact, I’ll say it here I think Henry James’ characters are rather dull and it takes everything in my being to finish one of his books. Yes, he’s one of the writers that is studied in academia, but that doesn’t mean he keeps the reader interested with the turn of every page. You, however, keep your readers on the edge of their seats. And that, I think, is part of what makes a great book! I’m really looking forward to #10 in the Spy series. I just have to know what happens with Ayden, John, Hellhound, Stemp, and our beloved Spider! Thanks, Cait! I love writing all my characters, so I’m always thrilled when my readers identify with them! 🙂 I’m afraid I don’t really enjoy most of the literary classics – I find them a hard slog, too. I guess it’s all a matter of taste, though – I read a great quote somewhere (wish I could remember who said it): “No two readers have ever read the same book.” I thought that expressed the idea perfectly! P.S. I replied to your private email a couple of weeks ago – did you get my response? I was fighting my email changeover then, so I just wanted to be sure. I’m fully convinced that the English profs I had foisted the miserable drech that society calls classics off on me solely because they were still angry at their profs for foisting same off on them! Well this insanity stops RIGHT NOW! Because I teach MATH, that’s why! And MACHINERY! AND HYDRAULICS! AND I MAKE IT INTERESTING! NO MORE WILL STUDENTS HAVE TO BE DRAGGED UNCONSCIOUS FROM CLASSROOMS AFTER DROWNING IN POOLS OF THEIR OWN EARWAX! What a swell thing you’ve done! That’s a serious life milestone you’ve just blown by! Most people never even consider driving one, much less actually getting to climb in the driver’s seat and ease out the clutch! Don’t give split-shifting another thought. That’s a big deal. And it’s not just getting the hang of knowing what do do next and making one trip up through the gears. It’s spending the considerable time developing the reflexes that allow you not to make mistakes, say, coming down steep grades heavily loaded in thick traffic. That takes a long time for anybody, and nobody, and I mean NOBODY picks up the first WEEK of training, much less the first TRIP. You done good, sister. You done real good. Which you already knew. The hair and the grin tell the whole story. Congratulations again. You can be proud of what you’ve done. And thirty-nine point thix per thent? Thmokin’, thithter, thmokin! Thanks! I’m still beaming – I couldn’t even sleep that night because I was on such a high! I’ve been talking about it to anybody who’ll listen ever since. And you’re right about the inside tires. I was watching the outside trailer duals pretty closely because I wanted to be sure of where I was in the lane, but I wasn’t paying much attention to the inside ones. And if I’d been experienced enough to know exactly where my truck was on the road, I probably wouldn’t have been looking much at the trailer wheels at all. I sure as hell couldn’t have heard them blow over the engine noise (John has straight pipes on his truck). Life should have more such moments. You’ve certainly earned yours! Makes me wanna giggle and dance, too, just reading about it! Felt exactly the same way after my first trip, and I had to learn it for myself. Trips were twenty-five miles one way, rolling hills, two lane road, in a truck that was geared for lighter loads on flatter ground. Thus, I got good at up- and down-shifting pretty quickly. Rural, thankfully. Really rural. The guy who owned the rig said, “Here ya go,” tossed me the keys, got in his pickup that one of his other drivers followed him over in, and drove away. Uh-huh. More or less. 😉 It’s good to be late twenties and bulletproof – I’d take that again any day. That kind of on-the-job training, though? Not so much. I really prefer to know what I need to know before I start moving something I can’t stop in a hurry. The 4th FIX book (due out in about a year, I think–it’s book 3 that’s coming out in a few weeks) opens with a scene on the infamous Vomit Comet (the zero-G plane that allows passengers to experience weightlessness for brief periods, basically by going into nosedives every few minutes). Civilians can actually purchase zero-G rides for around four or five thousand dollars. Hubs suggested crowd-funding to “send the writer on the ride of her life” for research purposes. Claims it would be good publicity for the book. Um…sorry, but no freakin’ way. Considering I get motion-sick even if I have to ride in the back seat of a car, I suspect the Vomit Comet wouldn’t be an experience to be treasured for me (but I’d probably load up on Gravol and try it anyway if I got the chance). Looking forward to your latest book! I’ve always thought that driving a big rig would be a blast and to hear you describe your day made me feel like I was right there with you! What a great experience! And you didn’t turn fiction into fact with Hubby in the passenger seat? Kidding! You’re a braver soul than I! I genuflect in your general direction! I can barely stand being in my SUV!